Today marks the start of the Joint US-China Cooperation on Clean Energy (JUCCCE) China Energy Forum in Beijing, which gathers 300 delegates from around the world in sectors ranging from government to industry to NGOs. JUCCCE Chairwoman Peggy Liu called on participating top executives and leaders to work closely together to provide more turnkey solutions for key people in China who are impacting the world with each decision they make. Representatives from the US Department of Energy, the US Presidents Council of Advisors on Science and Technology, China's National Development and Reform Commission (NDRC) Energy Bureau and NDRC Investment Association Committee began two days of dialogs with a call for more international collaboration. JUCCCE is a non-profit, non-governmental organization with offices in Shanghai, Beijing and San Francisco, working to accelerate the greening of China. JUCCCE is a virtually managed international network of advocates, corporate resources and volunteers collaborating on programs. Nixon Peabody, Dell, Owens Corning, Citi, Morrison and Foerster, GE, Tiandi Energy, SmithStreetSolution, Jones Lang Lasalle, MIT, Yale, Lawrence Berkeley National Lab are among the many international organizations that contribute to the programs in China. "JUCCCE is the international go-to group for a variety of green issues. The JUCCCE network has been hugely valuable to me as I work to promote green buildings in China," said Rob Watson, chairman of EcoTech International and JUCCCE US Green Buildings Champion. Today the JUCCCE team also unveiled its "China Energy Blueprint" with partners Augmentum and McKinsey. The web-enabled blueprint is a framework for turning analysis into action, mapping out transformation in energy use with global, multi-sector cooperation. Chairwoman Liu called on JUCCCE's extensive network of advisors to contribute, noting that "we must rethink energy." She was recently named a "Hero of the Environment" by Time Magazine. Anyone with Web access can contribute their industry insight and resources. Any not-for-profit or profitable energy related project can be listed and ask for help. More information can be found on www.juccce.com. "JUCCCE is the only organization in China that has effectively galvanized public and private sector leaders, thinkers and implementers. JUCCCE's blueprint for action is ambitious yet pragmatic," said David Nieh, general manager of Shui On Land and JUCCCE board member. "In a short time since its inception, JUCCCE is already exerting a significant impact in addressing real and immediate sustainable development needs, from policy advocacy to project development." In 2009, JUCCCE will focus on the development of their "five key market-transforming programs". "JUCCCE is impressive. Its talented team focuses on projects that matter, helping tackle China's clean energy challenges at the ground level," said David Sandalow, senior fellow of foreign policy at the Brookings Institution and member of US President-Elect Barack Obama's transition team. The JUCCCE "Green Lights for All" program, led by former GE general manager of APAC lighting group Onfrad Koo, aims to distribute over 10 million energy saving light bulbs to students and offer free compact fluorescent lightbulb (CFL) recycling. The bulk of the costs will be funded by carbon credits, based on the energy savings from exchanging incandescent bulbs with CFLs. 10,000 GE donated bulbs have already been distributed by Citi volunteers. 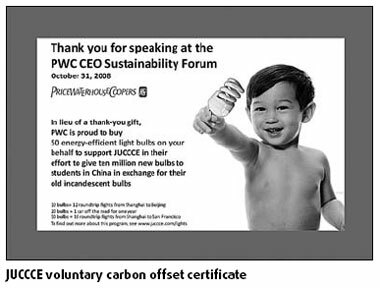 PriceWaterhouseCoopers helped launch the JUCCCE "Voluntary Offset Certificate" program at their CEO Dialog on Sustainability, where they purchased 50 light bulbs for each speaker in lieu of standard speaker gifts. On the second day of the JUCCCE Forum, Director Wang Zhongping of the Mayoral Training Center in Beijing, will sign a commitment to work together to provide mayors with turnkey solutions for city-level energy efficiency programs. The center is jointly run by two ministries as a "boot camp" for mayors. Working together with vendors who can help service cities, and international experts, the new JUCCCE course in development will educate and enable China's mayors to make smart energy decisions that will affect over 1 billion people and 683 cities. "JUCCCE is the most innovative sustainable energy NGO in China, bringing together business leaders who are passionate about identifying practical and scalable solutions that will make a difference in China," said Frank Rexach, vice-president and general manager of Haworth Asia Pacific, Middle East & Latin America and JUCCCE corporate sponsor. The author River Lu is project director of JUCCCE.